If you’re like me, you use your Mac laptop every day. Sometimes you use it while grabbing a quick bite. You use it reading the headlines while enjoying your morning coffee. Your children use it to play games. You carry it around in a backpack or messenger bag and use it outdoors or at coffee shops. That’s the versatility of a laptop. And with all that use your Mac laptop is bound to get dirty. The keyboard starts to build up grime. Pet hair pokes out around keycaps. The screen becomes greasy, smudged and spotted with small drops of liquid. It would be nice to clean it, but what’s a safe way? Should I use paper towels? Is water okay? What about Windex? Will I damage the screen if I rub it? How do I clean the keyboard? Many people have these questions and are justifiably concerned. No one wants to deal with a dirty laptop, but it’s also not worth risking damage to the laptop just to clean it. Many customers have contacted me after their laptop was damaged during a failed cleaning attempt. Shut the laptop down and move to a well-lit area. Use a can of compressed air to blow off any dust or other particles on the display. Also blow out any dust, pet hair or other particles from the keyboard. Make sure to hold the compressed air canister an appropriate distance away (6-8″) from the components when dusting and move quickly in a back-and-forth motion. By dusting first you ensure you aren’t rubbing dirt into the display and keyboard when you move on to the next step. Once the display and keyboard are dusted, lightly spray one corner of a new or very clean thick microfiber cloth (yellow cloth in above photo) with an electronics cleaner solution. Make sure to remove any tags on the microfiber cloth that may scratch the surface of the screen. You don’t want to drench the cloth, only make it damp enough that you can lightly feel the cleaner with you fingers when you touch it. The cloth should feel like the dampness of a hand towel after you’ve dried your hands. Start with cleaning the screen. Don’t spray the screen directly. Apply the solution from the microfiber cloth only. Use the lightly damp microfiber cloth and go over the surface of the screen gently and quickly. There should not be any beads of liquid dripping down the screen, only a light residue from the cleaner. If you seen any droplets rolling down, immediately wipe them up with the cloth. Once done use a dry corner of the cloth to buff out any grease and grime that has built up. If the screen is very dirty you may need to repeat this process additional times. Angle the display in the lighting to see if any smudges remain. To finish cleaning the screen, use the ultra-fine microfiber cloth (black cloth in above photo) to remove any small fibers and give a final buff. Once the screen is clean you can move on to the keyboard. The keyboard often retains food particles and oils from our fingers, so this why the screen should be cleaned first if using the same microfiber cloth. Spray a different section of the thick microfiber cloth if needed and go over the keyboard in a gentle and quick back-and-forth motion. Again, there should only be a very light film of cleaner on the surface of the keys. If there are any droplets of cleaner, immediately dry them up. Use a dry section of the microfiber cloth and go over the keyboard again in a quick, gentle back-and-forth motion. If the keyboard is very dirty you may need to repeat this more than once. Q-tips moistened with the electronics cleaner can be used to target problem areas. If you accidentally hit the power button when cleaning, shut the computer down and then resume cleaning. Once the display and keyboard are clean, you can use the same or another thick microfiber cloth to go over the exterior body of the laptop in the same manner. The key is to apply the cleaner lightly to the cloth first, rub gently and buff with a dry section of the cloth. Step back and enjoy your newly clean laptop! Don’t spray any components directly with a cleaning solution. 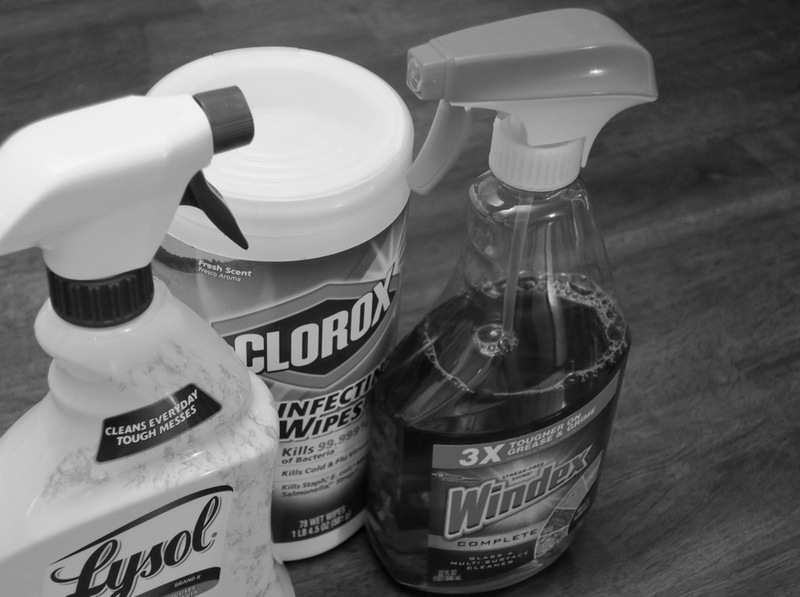 Don’t use traditional household cleaners like Clorox wipes or Windex. I’ve had several customers short out their display cables or damage the screen finish by spraying these products directly onto their Mac laptops. Don’t try to remove keycaps that may be sticky from residual liquid. There’s a rubber membrane that can be easily torn if cleaned after a keycap is removed. If this rubber membrane becomes torn, the entire keyboard has to be replaced. Don’t use your fingernails to rub or scratch dirt on the display or keyboard. 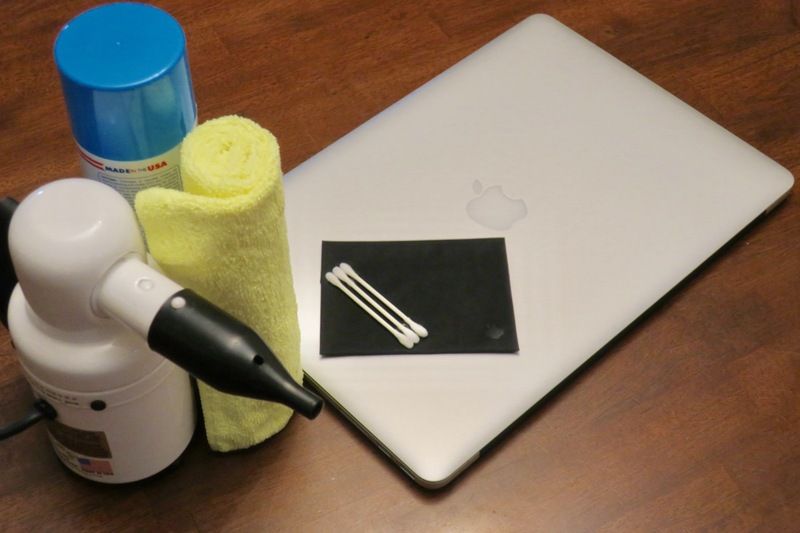 If you’d like to keep your Mac’s hard drive clean, see this post!